MAN ARRESTED FOR SMUGGLING RICE AS DEAD BODIES. The ban on rice importation and biting economic conditions are forcing daring smugglers to freight bags of rice as coffins carried in ambulances. This unprecedented antic of moving rice in an ambulance under the guise of corpses from Benin Republic into Nigeria was uncovered yesterday at the Seme Border by the operatives of the Nigeria Customs Service (NCS) who promptly arrested the vendor. The Customs mobile patrol team leader stated that the frequency of the said ambulance patronising the international route with the “dead bodies” had become alarming making it necessary to ascertain the identity of the dead. 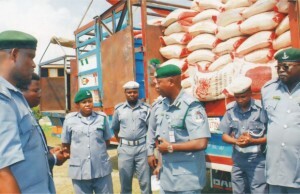 Rice smuggling across Seme Border became a lucrative trade to warrant such antic when the Federal Government banned rice importation into the country in its attempt to boost local capacity. Meanwhile, over 50 million bags of imported rice, worth over N1 billion, are currently trapped in various warehouses in Cotonou, Benin Republic, following the ban on foreign rice import into Nigeria. Many importers who violated the import restrictions by government are now regretting because they can no longer push the imported commodities into Nigerian markets. 0 on: "MAN ARRESTED FOR SMUGGLING RICE AS DEAD BODIES."